Where beat of words keep you alive. 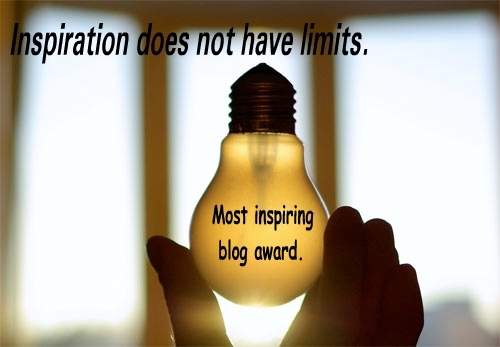 Top 10 most inspiring blogs. For me reading other peoples work is as important as writing mine. Publishing posts is not just part of a blogger, but how to make his blog look attractive, to make the reader just be curious what he is writing, and on top of that the most important, to know how to read other peoples work are the things that through my experience have been the most important steps to reach your goal of a writer. And I have honestly been inspired by each and every of you who I have followed. And no, I don’t just follow people, I take my time surfing the blog and then I follow. So below are the blogs I have loved really badly. From 70 blogs ( or more) that I love, it was indeed pretty difficult for me to choose! A new blog I just started following, love love love the poetry in it! This blog didn’t just inspire me, but the owner always supported me. In face, it was one of my first 3 followers in wordpress. Yes yes, food! Evelyn brings up these really delicious recipes and honestly, they are very easy. For a beginner like me, I don’t think there is any way you could make this yummy food, with this less effort! If you love poetry, you should seriously check this blog. I love love love his poems! And even though I just started getting to know him and his blog, I am more than satisfied by how inspiring his blog makes me feel. This is again one of the oldest blogs I have been following. The pictures are honestly breath taking! I don’t know what to say about this blog. If you get to follow it, know you are one of the luckiest people in the world. The landscape pictures he takes are so breath taking! Sometimes when he writes a new post, I literally skip what he wrote out of curiosity what picture he took! Honestly, his work is brilliant! You should check this blog! His work is brilliant, from all the journey of his life in Belgrade he took so many fascinating pictures. You would definitely like his work. I have been following him for a long time now, and each of his post has inspired me and made me want to go to those streets where he took the pictures. Another blog, with another brilliant talent. His work takes you from WOW to god I don’t know how to compliment him! Sitting in front of him, there was a moment of awkward silence when mom and my brother left us for a while so we could spend some time together. Oh my god, why do I have to do this? Suddenly the unknown guy with the suit interrupted my thoughts saying: ” So.. your name is Katrina, right?”I nodded, trying to pull a smile. And then he continues,:”Well I am John.” He said. Then a moment of silence again. I didn’t know what to say, or how to react, all I was doing is looking to the ground and trying to smile. I didn’t now what to say, therefor I thought how to make some connection to this guy, as I will have to marry him, and eventually I said something I didn’t know I would: ” So, do you know how to swim?” That was stupid. Katrina, what was wrong with you? But he smiled. ” Yup. Love the shore. What about you?” I smiled back, this time a real smile, I asked him if he would want to come to the shore, and he said yes. Although it gave me second thoughts about him going to the beach in that suit,in the end it didn’t really matter. At least we don’t have to sit silently and look at each other. We came to the sandy part, I took off my ballerina shoes, and felt the sand on my feet. This is one of the feelings I can never explain, entering the sandy part of the beach and listening to the waves. I looked at John who was standing and looking questioned for a moment. He didn’t take his shoes off, weird. ” My family is dead.” He said in a cold voice. Okay, I think I was a bit harsh by taking it all off on him. But he continued: ” And about marrying you, there is a reason, a reason that I can’t tell you yet. But I am not forcing my self on you. If you want to marry me, I will keep you happy as long as I can, if you don’t want to, I will walk away. But give me a chance before you make your decision. I nodded. Deep in me I liked how he gave me the space to make my own decision. And I did start liking his suit, even though I wish he wore something less formal, if this is counting as our first date. ” Katrina!” Called mom while I was sitting near the shore, looking into the water and listening to the beautiful sound of the waves, I didn’t realize I have been sitting here for more than 30 minutes. Why is mom so worried all the time? I wondered inside. She should take it easy sometimes… I thought to my self while getting up to see what mom wanted. And then I remembered, it was 4:45 pm and at 5 was my so called future fiancé was coming. All I was wearing was an old dress with my hair untidy on my shoulders and I barefoot. Who needs sandals? I love the feeling of the sand on my feet, I never wear slippers to the beach. I was running inside my house when I saw him, he was wearing a suit and was standing with flowers. Who on earth is he? Why would mom make me marry him when I don’t even know him? Yet on top of that, I didn’t even finish my medical university. I am only twenty! I know that dad passed away and that she can’t afford the living, but I also know that, it wasn’t the real excuse she was making me marry this guy. It was that the people around the village thought I had an affair, because, well, I didn’t want to marry anyone. Thats why! And here comes the prince charming, rich, shaved, with flowers. Doesn’t even know me but wants to marry me. What kind of a guy is he? I quickly hid my self and went inside the house from the back door. Quickly going upstairs into my room. Closing the door after my self. ” Katrina! Where are you? I swear this girl will never ever get anything in her life….” Said mom. The door rang. I quickly combed my hair, put on my white ballerina shoes with a soft pink dress that had a white belt with a bow in the middle. I loved dresses. Even though I had those really bad looking legs from playing a lot of sports outside, I never hesitated showing them. After all, each marks define who I am. ” Katrina! ” Cried my big brother, oh my god, I think I should change my name. Frustrated, I was going downstairs, to see my fiancé and to talk to him. There you go, my new life. I don’t even know his name, but I will be his wife in a few months,most probably, if by any chance I make my mom think about it giving me time and letting me at least finish my 2 years of medical before marrying this guy. Yes, I started writing my own I don’t know, book? Story? Doesn’t matter, I always enjoyed writing in this form more than in the form of poetry.Gave me the ability to show my feelings in words more than in a 4 line paragraph. I am on Facebook and in Good Reads! Liked my blog? You don't have to always check around if I have a new post. Instead subscribe!